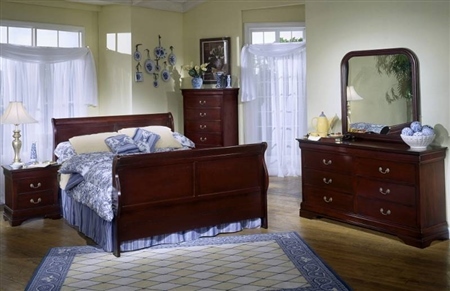 Refine your bedroom with the traditional styling of this bedroom collection. This assortment offers a classic look and feel, including pieces such as a nightstand, dresser, mirror, and chest. A beautiful sleigh panel bed lies at the heart of this collection, offering an elegant and sophisticated look for your master suite. A rich cherry finish emanates warm brown tones to soften and soothe, while simple moldings and beautiful hardware pulls add subtle detailing to the woodwork that is visually interesting and appealing.